Today is my father’s birthday! 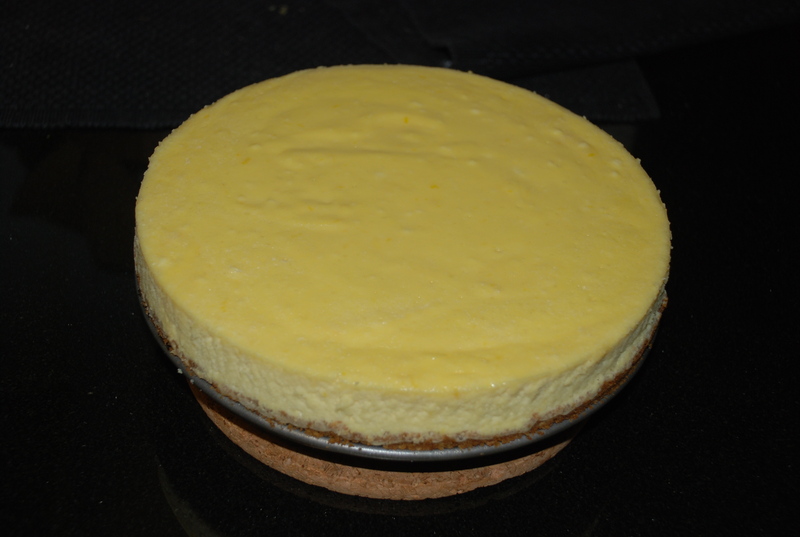 I made cheesecake with a slight lemon flavor. This is what what I think a New York style cheesecake is suppose to taste like, thick slice and creamy consistency, yum! Don’t feel too guilty for eating it since I cut half the amount of sugar in the recipe. 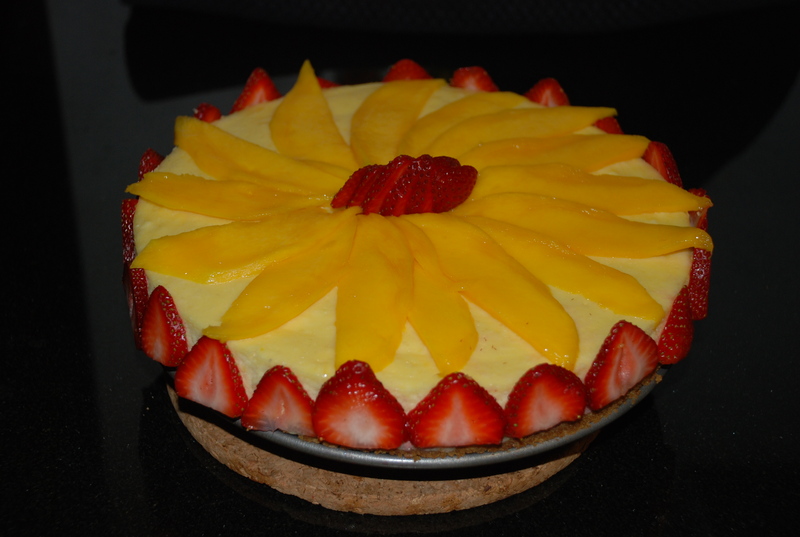 I had a mango and strawberries in my fridge, used those to make a pretty flower design. all the ingredients and tools you need. Vanilla extract is optional, I accidentally put it there, it’s for a sour cream topping in the original recipe. 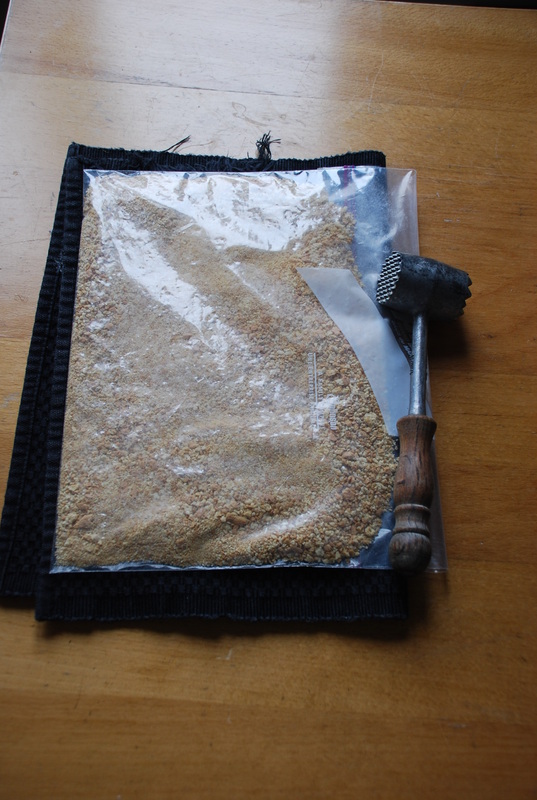 Once again if you are feeling stressed use that meat tenderizer to crush those graham crackers! 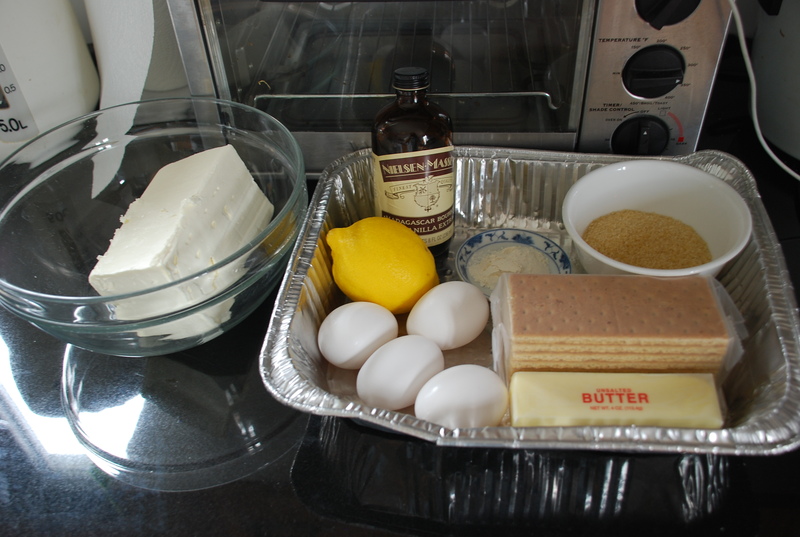 The egg, cream cheese, sugar, lemon and flour. A bit lumpy buts it’s okay, keep going! 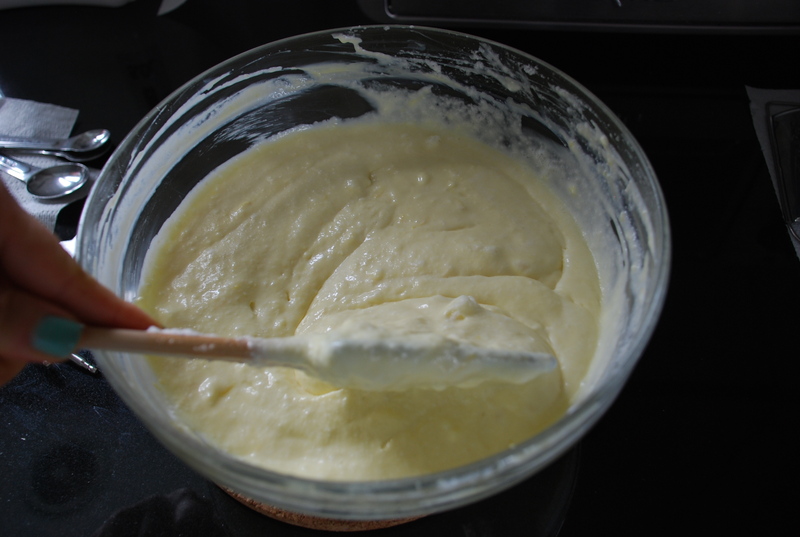 Added the egg whites and folded it into the batter. Do not stir the egg whites or else all the work you did to make the egg whites peak will be for nothing. To fold the egg whites you should use a spatula and gently lift the batter from underneath to “fold” the batter over its self. When you take off the springform you are left with a lovely plain cheesecake. Mine did not brown on top but its okay. 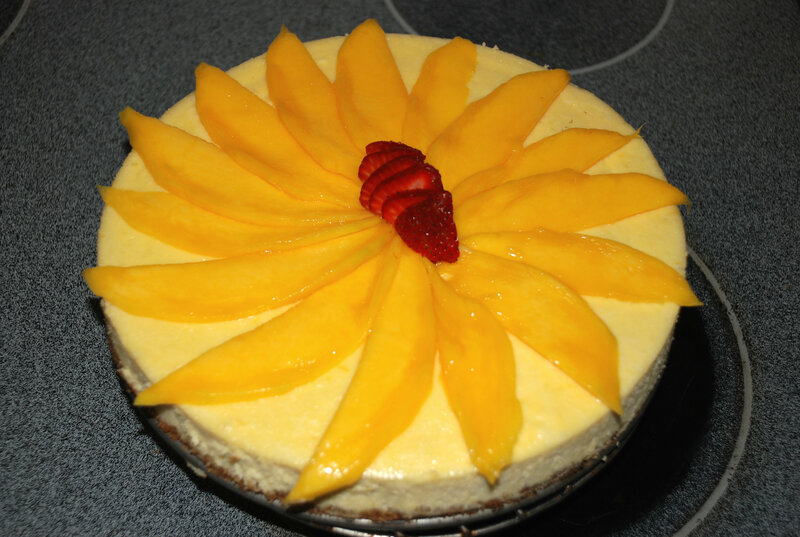 Sliced up the mango and strawberry and make this flower design. I thought about this design all day and had a little day dream about it too. Added sliced strawberries to the side of the cheesecake to make it more colorful. adapted from Mark Bittman: How to cook everything. For this recipe you need a springform pan and put it in a water bath. What I learned is to wrap the pan in two layers of aluminum foil to prevent the water from seeping into the cake. Now you don’t have to do this but for my own sanity I had to do it cause who wants a damp crust. Although, once you put the cake into the fridge to let it cool you will not notice it. If you do take the aluminum foil route, the water level will stop just a little under the lowest edge of the aluminum foil. If you do not have a large baking pan to put the springform pan into, don’t fret, use a aluminum foil pan. When using that aluminum foil pan I suggest that you pour the water in when you put the pan in the oven since the foil pan might be wobbly when moved to the oven. Use an electric mixer to beat the egg yolks until light; add the cheese, lemon zest and juice, and 1/2 cup of the sugar and beat until smooth. Stir in the flour. Beat the egg whites until they hold soft peaks; use a rubber spatula or your hand to fold them into the yolk-cheese mixture gently but thoroughly. Turn the batter into the prepared pan and place the pan in a baking pan or aluminum foil pan large enough to hold it comfortably. Add warm water to the baking pan, so that it comes to within an inch of the top of the springform pan. Transfer carefully to the oven and bake until the cake is just set and very lightly browned, about an hour. You can line your springform pan with parchment paper to make it easier to transfer the cake and not scratch the bottom of the pan. Crush the graham crackers with a meat tenderizer or food processor. 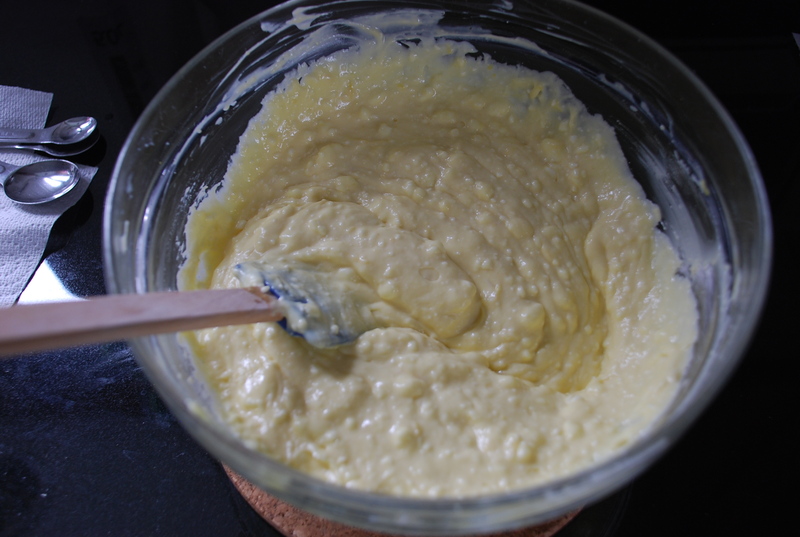 Melt butter in a saucepan or microwave for 35 seconds. Combine graham cracker crumbs with melted butter in a bowl. Press the crumbs into the bottom of the pan. Bake for 8 to 10 minutes till browned and let it cool.